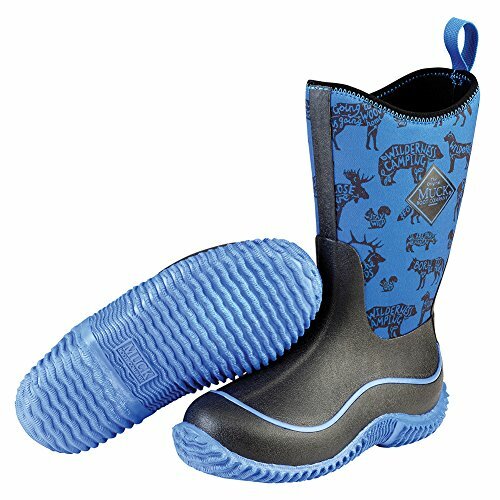 Keep children's feet protected from wet, rainy weather and muddy conditions in Muck Hale Multi-Season Kids' Rubber Boots. Comfort rated from subfreezing to 65 °F (18 °C), these 100% waterproof kids' boots feature a lightweight 4 mm neoprene bootie for comfortable three-season wear. The durable ribbed outsole is self cleaning for stability on slick sidewalks, and it also wraps around the boot for extra grip. These neoprene boots have a back tab and wide opening that make them easy to pull on and off without fuss, while the inner PM Mesh lining keeps active feet cool and dry. These kids' boots are easy to match with just about any outfit.